Black bass, bucketmouth, widemouth, green bass, green trout, widemouth bass. The largemouth bass is a heavy-bodied fish typically olive-green in color, with shades of brown. Dozens of dark, oval blotches mark all along the side of the fish, forming a jagged horizontal line. Unlike smallmouth bass, a largemouth's upper jaw extends beyond the eye. JP DeRose holds up two bucketmouths. North American bass tend to grow between 10-30 inches (25-76 cm), depending on the area. 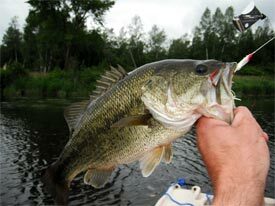 Warmer lakes produces larger bass than northern bodies of water. On average they rarely exceed 10 pounds (4.5 kg), but the maximum recorded bass weighed 25 pounds (11.3 kg). In certain parts of the world, such as Japan, largemouth bass are an invasive species, and therefore grow to greater sizes than average given their lack of predators. They are native to eastern United States and southern Canada but have been introduced throughout the North American continent where it's warms and many places around the world. Largemouths thrive in lakes, ponds, and reservoirs that are shallow, with lots of cover and generally a muddy bottom floor. Weedbeds are a favorite for largemouth as they provide both protection from predators and cover for hunting prey. However, largemouth bass have adapted to live in many different kinds of habitats, including clear and rocky lakes and rivers with currents. On average bass live to see 15 years, with rare recorded exceptions exceeding 20 years of age. In short, anything small enough it can swallow. Panfish like blugill and sunfish are a favorite treat, but anything from worms, frogs, snakes, crayfish, bats, water birds, mammals, and more. Largemouth bass spawn in the spring when temperatures rise above 60° F (15.5° C). Spawning grounds vary from gravelly sand to soft mud in reeds. Males guard the nest and continue to protect the young for the first month after hatching. Juvenile bass fall prey to walleye, northern pike, and muskie. As bass grow bigger, predation becomes much less of an issue, though a large muskie will always pose a threat. Credit for information above: Fisheries and Oceans Canada and Alabama Department of Conservation and Natural Resources. What Makes Largemouth Bass Fishing so Special? Largemouth bass commonly jump out of the water when fighting the retrieval. The most popular target for freshwater anglers in North America is the largemouth bass, especially in the United States. A big reason for this is the sheer abundance of the species, as it can be found in ponds, lakes, and rivers in great numbers throughout much of the continent. For stocking purposes, largemouths can easily adapt to many different styles of lakes and can coexist with many different species without causing too much of a negative environmental impact. Certainly its desired habitat is warmer waters with plenty of vegetation, cover, and shallow depths, but a clear, rocky lake can still support a healthy largemouth population. What really drives the largemouth bass' popularity is the sheer joy it is to reel in a lunker. Bucketmouths have a well-deserved reputation for being a tough and entertaining fighter. They're head-shakers that'll go so far as jumping out of the water in an attempt to get free. Moreover, largemouth bass love to go after artificial baits so much that live bait is pretty much never required, unlike other species of fish like catfish and even walleye. The fun also lies in the thrill of the hunt. Sure they'll go after any number of lures and baits, but it's finding out which pattern and technique is the right one for the right time that'll really get you results. Finally, anyone can fish for largemouth bass. You don't have to have a bass boat with a huge motor and all the latest gear to catch a bass (though they certainly help get you better results). A child fishing off shore can have just as much luck as anyone from a boat if the conditions are right as largemouths are relatively easy to catch in comparison to other species of gamefish. There are many ways to catch a bass, but the methods below are used the most, and for good reason – they work. Master these techniques to maximize your performance as a bass angler. When bass are not all that active and are hiding in thick cover, it’s as if you have to go into stealth mode to catch those shy lunkers. The best methods for getting to thick, shallow water without spooking fish too much are pitching and flipping. They are similar looking techniques, but some occasions require one over the other, especially as it pertains to distance. The key to successful pitching/flipping is practice, a long rod (6.5’-7.5’), and the right soft bait. Pitching is the easier of the two, but is not as precise as flipping. Let out enough line so it’s about even with the reel, and keep your reel open. Lower the rod tip towards the water and with your free hand, grab hold of the lure (worm and tube jigs work best) and pull on the line to add tension. In one smooth motion let go of the lure while swinging your rod tip up. This combination should slingshot the bait towards your target. Be sure to close the reel as soon as the bait lands because bass often strike quickly. Flipping takes more practice, but once you get a good feel for it, you can optimize your presentation and hit your target location more precisely than pitching. Begin by letting out somewhere between 8-15 feet of line and then close your reel. Grab the line between the reel and first rod guide, and then extend your arm to the side as you pull on the line. Raise the rod and the bait will now swing towards you. Using a pendulum motion swing the bait to your desired location while feeding the line through your hand. Tighten up the remaining slack and get ready for a strike. It looks a little awkward, but it’s a great way to get a drop on some shy bass. Largemouth caught with a topwater lure. For many anglers there’s nothing more exciting than catching a bass with a surface lure. Unlike pitching or flipping, topwater lures are meant for hungry, active fish. 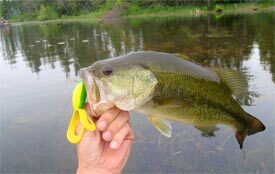 There are several kinds of surface lures, like poppers, jitterbugs, and frogs. 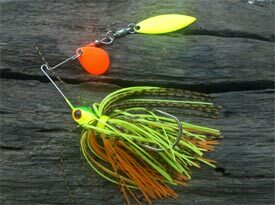 Some topwater lures are easy and work best with a slow, steady retrieve, like a jitterbug. Others take some more technique. The aptly named ‘popper’ requires an angler to literally pop the lure as it is retrieved, pausing every few seconds and allowing it to go steady, imitating a wounded fish. The sporadic stopping and moving can drive bass crazy. Another popular retrieving method is called ‘walk the dog,’ commonly used for soft surface frog baits. Walking the dog is where you quickly twitch the rod tip up and down for the duration of the slow retrieve. A crankbait is all about reflex for a bass. They won’t want to chase it down the same way they would for a surface lure, but even so, noise and presentation is still key to using a crankbait right. Crankbaits are a favorite for many tournament anglers because they cover a lot of water, both horizontally and vertically at a variety of depths. They work best around solid objects, like rocks, logs, and stumps. It is possible to use a crankbait along the side of a weedbed, but generally drop-offs and rocky shoals with plenty of solid cover works best. The more you get to know the feel of the way your crankbait swims through the water and bumps into objects the better you will be at catching bass. Spinnerbaits are a great year-round lure that can produce results on any given day on any given lake. Retrieval should range from slow to medium speed, and like the crankbait, works best around some solid structure. There are several different ways to use this versatile lure. One method is to allow the spinner bait to fall to the bottom near a drop off. As it hits bottom, reel up the slack, then allow it to fall to the bottom again. Repeat. For the most part, however, you'll be reeling in continuously at different paces. The slower you reel in, the deeper the bait tends to swim through the water. When you reel in at a faster rate, try to not to breach the surface. Hanging just below will create a wake that some fish will find irresistible. Possibly the simplest technique for bass fishing and certainly the easiest to pick up is jerkbait fishing. The hard part is knowing what jerkbait to use and when to use it. The lures come in many shapes and sizes that swim at varying depths, but no matter how different they may be, the goal remains constant: imitating a wounded fish. As the name implies, jerking the rod tip with a little twitch as you reel in gives the impression that your jerkbait isn’t swimming at full health. Bass love an easy meal, and that’s what you’re tying to mimic. Jerkbaits are best reserved for clear waters as sight is the most important factor for success with this technique. This finesse form of fishing takes a little more effort to rig up than the others, but it’s a crucial technique nonetheless and should be a part of any serious bass angler's repertoire. If you've fished with a plastic worm, then you can adapt quite quickly to dropshotting. The major difference is that the weight is below the worm – as you reel up the worm and work its magic, the sinker bounces along bottom, leaving your worm several inches up, free for the taking. The length between the worm and sinker can range anywhere from a few inches up to a foot-and-a-half, it all depends on how high you want the bait suspended from bottom. Unlike the other techniques mentioned here, the retrieval isn't what's important. The key is moving your rod tip in a way to make your bait dance as enticingly as possible. 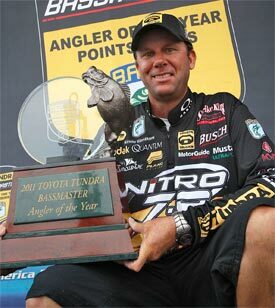 Kevin VanDam is often referred to as today's best bass fishing angler. The most popular tournaments with the highest payouts for tournament fishing in North America involve bass, with largemouth being the number one target. 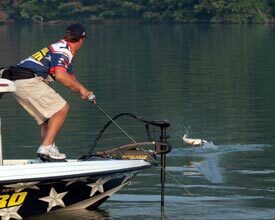 Pro tournament fishing is a big business in the United States, backed up by dozens of smaller tournament series, like the American Bass Anglers or Skeeter Bass Champs. Below is some more detailed information on two of the biggest bass fishing tournament organizations in the world. Certainly the most popular tournament organization in the U.S. is B.A.S.S. (Bass Anglers Sportsmen Society), a mulit-billion dollar fishing industry that hosts several successful tournament series - Federation, Bass Pro Shops Opens, Weekend Series, and College, for example. The biggest and brightest of them all, however, is the Elite Series. Many of the world's top anglers compete for a top-prize paycheck of $100,000 per tournament. Perhaps most important of all, however, is that Bassmaster plays host to what many consider the Super Bowl of bass fishing: the Bassmaster Classic. A field of just 50 anglers compete for the top prize of $500,000 and a title that is the most revered in tournament fishing anywhere. B.A.S.S. may have the history, prestige, and the world's most cherished fishing tournament, but the title of the most lucrative tournament organization belongs to FLW Outdoors. Coming to fruition less than two decades ago (1996), FLW Outdoors now boasts more tournaments than any other organization - as many as 191 in 2011 when factoring competitions for other species, such as walleye - and offers more money per competition than even B.A.S.S. The headlining series is the Walmart FLW Tour, where top professional anglers compete for a top prize of over $100,000, much like the Bassmaster Elite tournaments. FLW Outdoors' equivalent of the Bassmaster Classic is the Forrest Wood Cup. The main differences between the two juggernaut tournaments is that the Forrest Wood Cup not only offers a larger top prize ($600,000), it also runs a competition for co-anglers, whereas in the Classic pros fish alone.